Jaw-dropping full-color artwork breathes life into a mute boy's fantastic odyssey through time and space in this award-winning debut from the booming Brazilian comic scene. Ye is a curious young man, named after the only sound he knows how to make. His voice must have been stolen by the Colorless King, the source of all the world's sorrows -- terrifying, unrelenting, all-taking and never-giving. Now, Ye has no choice but to embark on a long voyage over land and sea, past grizzled pirates, a drunken clown, and more, to find the famous witch who can help him defeat the Colorless King. What he discovers may be a lesson for us all. 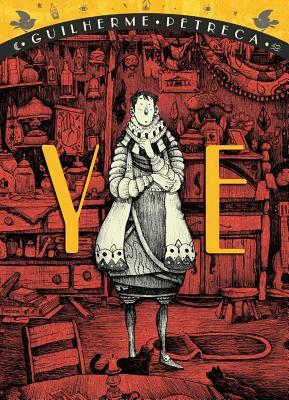 Young cartoonist Guilherme Petreca won Brazil's prestigious HQ Mix Award for Best Artist due to the unforgettable imagery on every page of Ye, his first full-length graphic novel. In the tradition of The Little Prince, The Neverending Story, and A Wrinkle in Time, this graphic fable will leave young and old readers awestruck and eager to relive the journey. Guilherme Petreca is a comic book artist and art director in animation projects for TV, games, and short films. He's been publishing comics since 2013 and recently was awarded Brazil's prestigious HqMix Prize for Best Illustrator for his work in Ye, which is his first work to be translated into English.